In this feature Caroline Raine discusses the changes being brought into the Globally Harmonized System of Classification and Labelling of Chemicals (GHS) revision 8. The UN GHS Purple Book is updated every two years and the eighth revised edition of GHS (GHS Rev 8) is expected to be published later in 2019.
if applicable, test results from the ignition distance test, the enclosed space ignition test and the aerosol foam flammability test, performed in accordance with subsections 31.4, 31.5 and 31.6 of the United Nations Recommendations on the Transport of Dangerous Goods, Manual of Tests and Criteria. There is a proposal to include in the GHS a pictogram to be used in addition to P102 “Keep out of reach of children”, and a paper proposing a rationalisation and simplification of P201 and P202. Several scientific studies have confirmed that visual representations or pictograms can be recognised more quickly and intrinsically trigger more spontaneous interest than written warnings. One such study concluded that “inclusion of GHS hazard pictograms and precautionary pictograms to SDS and labels may benefit the user”. It is estimated that about 14% of the world’s population cannot read and so the use of simple and intuitive precautionary pictograms can be an effective means to convey essential safe use information on hazardous chemicals. The objective of the proposal is to seek a common way — at the global level — to help reduce the number of incidents where young children come into contact with chemicals, through the adoption of one simple and intuitive precautionary pictogram to convey the message “Keep out of reach of children” (Precautionary Statement P102). This can be achieved by including this precautionary pictogram in s.5 of Annex 3 of GHS. The following examples convey the meaning of precautionary statement P102 “Keep out of reach of children” and may be used to convey information in more than one way accordingly. 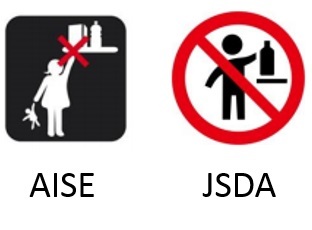 One pictogram is from the International Association for Soaps, Detergents and Maintenance Products (AISE), while the other one is from the Japan Soap & Detergent Association (JSDA). It will be important for the labelling of chemical products supplied to the public. The intention is to add the precautionary pictograms to the GHS (Annex 3 s.5 after paragraph A3.5.1.). It is intended to further improve the examples for sets or kits by adding a new example “Labelling of sets or kits” in Annex 7 of the GHS. The set or kit comprises an outer packaging containing the following inner containers. Four cuvettes, each filled with the same substance or mixture (Reagent 1). Two larger containers each filled with another substance or mixture (Reagent 2). The approach is to provide minimum information on each of the inner containers containing hazardous substances or mixtures, and to provide the full GHS label information for each hazardous substance or mixture on the outer packaging. For clarity, the full label information for each hazardous substance or mixture is grouped together on the outer packaging. As the area available for a label on the inner containers is not sufficient to include all the required GHS label elements, the following minimum information is included on the label of each hazardous substance or mixture. Product identifier, and an identifier for each substance or mixture matching the identifier used on the outer packaging label and SDS for that substance or mixture, eg “Reagent 1” and “Reagent 2”. The statement “Read full label”. Supplier identification (ie name and telephone number). 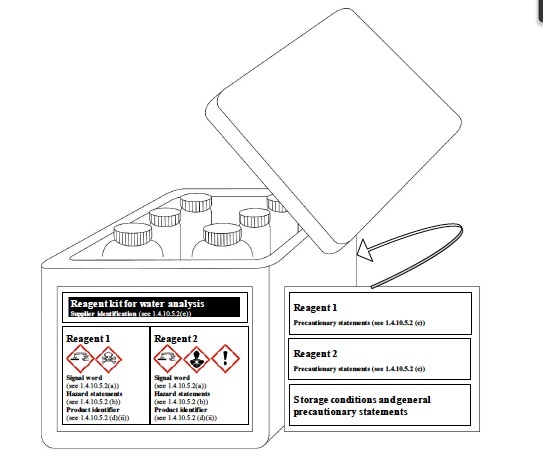 In addition to the set or kit identifier, in this case Reagent Kit for water analysis (see below), all the required GHS label elements appear on the outer packaging for each hazardous substance or mixture. The label elements for each substance or mixture on the outer packaging are grouped together in order to distinguish clearly which label elements are assigned to which substance or mixture. However, the supplier identification needs to appear only once on the outer packaging. Where possible any supplemental information may also be included on the outer packaging. When a large number of precautionary statements are required, the precautionary statements may be located separately from the rest of the label elements, though general precautionary statements (Table A3.2.1) and precautionary statements for storage need only appear once (see also A3.3.2 in Annex 3 on flexibility in the use of precautionary statements) to avoid inappropriate statements, taking into account the nature of the user (eg consumers, employers and workers) the quantities supplied, and the intended and foreseeable circumstances of use. 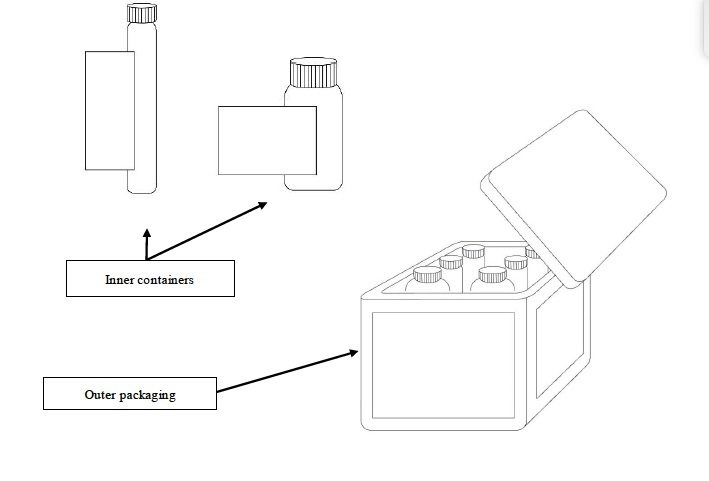 In these circumstances, the precautionary statements for each substance or mixture should be grouped together on the same side of the outer packaging and on a surface that is visible under normal conditions of use. There is a second scenario that has also been included. An informal working group was created “to eliminate inconsistencies in the presentation of precautionary statements in Annex 3, including looking at disparities between the application of precautionary statements for different hazard classes/categories”. There are only two hazard classes where the subcategorisation is not accurately reflected in Annex 1 and in ss.1, 2 and 3 of Annex 3. Skin corrosion/irritation, where the classification can be category 1 only where the available data is limited and subcategories 1A, 1B or 1C cannot be assigned, or where required by the competent authority (3.2.2.1.1.2). Serious eye damage/eye irritation, where the classification can be category 2 where the available data is not sufficient for further categorisation, or where the competent authority does not require categorisation into 2A or 2B (3.3.2.1.2.1). To enable appropriate allocation of precautionary statements for skin corrosion category 1 as well as for subcategories 1A, 1B and 1C, changes are needed to the hazard categories assigned to the following precautionary statements in s.2 of Annex 3: P260, P264, P280, P301, P303, P304, P305, P310, P321, P330, P331, P338, P340, P351, P353, P361, P363, P405 and P501, plus listed combinations including these statements. In each case the change is simply to replace the existing entry “1A, 1B, 1C” in column 4 of Tables A3.2.2, A3.2.3, A3.2.4 and A3.2.5 with “1, 1A, 1B, 1C”. To enable appropriate allocation of precautionary statements for serious eye damage/eye irritation as category 2 as well as for categories 2A and 2B, changes are needed to the hazard categories assigned to the following precautionary statements in s.2 of Annex 3: P264, P280, P305, P313, P337, P338 and P351, plus listed combinations including these statements. In each case the change is simply to replace the existing entry “2A, 2B” in column 4 of Tables A3.2.2 and A3.2.3, with “2/2A, 2B” or with “2/2A” as appropriate. on the second page of the matrices for eye damage/irritation, under Hazard category, “2A” should be replaced by “2/2A”. In addition, it was noted that in the matrices of precautionary statements by hazard class/category in s.3 of Annex 3, hazard category “1” for the hazard classes germ cell mutagenicity, carcinogenicity and reproductive toxicity should read “1A, 1B”. Revision 8 of GHS is expected later in 2019 and brings in changes that help to improve hazard communication through the addition of new pictograms for “Keep out of reach of children” and the elimination of inconsistencies in the presentation of precautionary statements. Additional clarity on the labeling requirements for sets or kits has been given through the use of examples. Remain compliant and stay ahead of industry changes in Hazardous Substances.